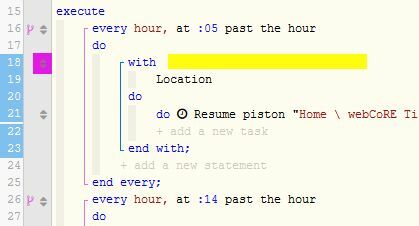 To drag & drop code in your piston, you can go into Edit mode, and then click up top to turn on that feature. Hold down Ctrl while dragging to make a copy. 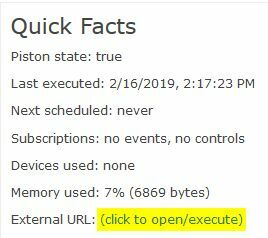 NOTE: If you want to copy the block into a DIFFERENT piston, you can select the block as mentioned above, and then right click to copy that selected text to your webCoRE clipboard. This will be available when you add new statements in other pistons. I often hear people talk about "Virtual Switches" and "Simulated Switches" interchangeably, but it's important to note that they use different Device Handlers, so they are definitely not the same. 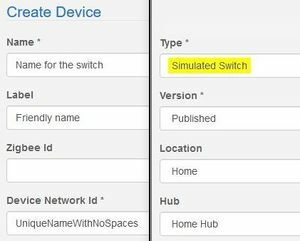 Personally, I will only recommend using "Simulated Switches", since I have seen a lot of issues involving virtual switches. Side Note: Sometimes I have to use an "Incognito" or "Private Browsing Window" to be able to save the new device. Once the device is added, ST will see it within a few seconds, but you will also have to add the device to webCoRE. Command prompt / batch file / macro tool etc. ... and the piston in your main house would trigger a moment later. Generally speaking, the piston that is getting triggered by the external call should have no triggers (lightning bolts). One of the benefits of having no triggers is that this piston can be triggered from multiple locations and different events. This page was last modified on 12 April 2019, at 18:28.